From now through Election Day and beyond, NBC News is tracking reports of voting problems and irregularities. That includes claims of fraud or intimidation, long wait times, machine snafus, controversies over counting votes and anything else that could threaten the right to vote or the integrity of the process. We will update this list frequently, with the newest developments at the top. Scroll to the bottom for more information on this project. The Indiana Democratic Party accidentally sent out text messages with incorrect polling places to up to 2,000 voters, party officials confirmed Monday. Some voters who got the messages over the last 24 hours were concerned that it was deliberate misdirection, in party because it came from an unidentified sender. But the party clarified that it was an innocent mistake affecting a fraction of hundreds of thousands of reminder texts that have been sent to Democrats. The party was sending out a new message directing voters to check www.indianavoters.com to confirm where they should cast their ballots on Tuesday. Party officials said none of the messages were sent to Republicans in the state, which leans GOP. Numerous voters who got the wrong-way texts contacted the Marion County clerk's office or the state Elections Division, or posted on social media, prompting the Indianapolis Star to publish a story. Laura Strate, a registered Democrat who got one of the messages, called the experience "really weird." She was relieved that there wasn't anything nefarious behind it, but still worried that it could sow confusion. "What if someone goes to the wrong place, waits in line for a long time, realizes its the wrong place and says, 'I don't have time to get to the right polling place,' and doesn't vote?" Strate, who posted on Twitter about the mysterious text, told NBC News. "Whether it's shady or just stupid, the result is the same." Black voting in North Carolina is down by over 8 percent from 2012. The drop-off comes after some counties reduced polling sites and hours. Read more here. A federal judge denied Democrats’ request to issue an injunction against the Republican National Committee for violating a long-standing consent decree that bans the RNC from carrying out a range of poll-watching activities. Democrats had presented evidence that they said showed the RNC was conspiring with the Trump campaign to engage in poll-watching, in violation of the decree. That evidence included Trump’s frequent calls to supporters to closely monitor the polls in "certain areas," which have led to fears that minority voters in particular could be blocked form voting or intimidated. But U.S. Judge John Michael Vazquez in New Jersey said there wasn’t currently enough evidence to support the claim, though he declined to rule on the merits until after the election. 11/5 4:05 p.m.: Judge: North Carolina illegally purged voter rolls. A federal judge ruled Friday night that North Carolina allowed three counties to illegally purge voters from the rolls and ordered that the voters be allowed to cast ballots. Read more from NBC News' Pete Williams here. A new report finds a “widespread effort to close polling places” in counties with a history of racial discrimination in voting. Counties previously covered under the Voting Rights Act will have at least 868 fewer polling places this year than in past elections, according to the report by the Leadership Conference Education Fund, an arm of the Leadership Conference on Civil and Human Rights. Forty-three percent of the 381 counties studied had reduced the number of polling places. The study could only confidently include half of formerly covered counties, meaning that there are likely many more. In Arizona, nearly every county studied had cut polling places. In Louisiana, 61 percent of parishes reduced polling places. In a limited sample of Alabama counties, 67 percent closed polling places. In Texas, 53 percent of counties in the limited sample reduced voting locations. North Carolina — where black turnout so far is significantly down since the last election — has 27 fewer polling places compared to 2012, and that’s only in the 40 percent of counties that were once covered by Section 5. Counties with histories of racial discrimination — mostly in the South — were previously required under Section 5 of the Voting Rights Act to have all their voting changes pre-approved by the Justice Department, to ensure they didn’t harm minority voters. The Supreme Court’s 2013 ruling in Shelby County v. Holder ended that requirement by invalidating the formula that determined which areas were covered. The report notes that there are sometimes legitimate reasons to close polling sites. Texas and Arizona, for instance, have moved to using “vote centers,” in which there are fewer sites but all voters from the county can use any site. But in Maricopa County, Arizona, this new system led to all-day wait times for primary voters earlier this year. The report’s authors warn that without Section 5, there’s no way to ensure that the closures aren’t disadvantaging minority voters, and it’s harder to ensure that voters are notified about changes. Keep in mind that these counties all have histories of racial discrimination in voting, which is why they were covered under Section 5 in the first place. A Kansas court has ordered the state to stop using a two-tiered voting system that would have barred certain voters from casting ballots in state and local races. Judge Larry Hendricks’s ruling Friday afternoon affects about 19,000 voters who registered to vote at the state’s motor vehicle office or via the national mail registration form. Kansas Secretary of State Kris Kobach, a Republican, had barred such voters from voting in state and local races because they didn’t provide documentary proof of citizenship when they registered. A controversial Kansas law, which Kobach pushed for, requires such proof — but a series of court decisions have punched major holes in it. A federal judge has said he plans to issue an order barring the Trump campaign and Trump ally Roger Stone from intimidating voters at Ohio polling places, the Cleveland Plain Dealer reported. The comments from U.S. District Judge James Gwin came in response to a Democratic lawsuit. Gwin didn’t give details about exactly what conduct the order will prohibit. Democrats have filed similar lawsuits in Arizona, Nevada, Michigan and Pennsylvania. The suits allege that Republican plans to aggressively monitor the polls could intimidate minority voters. Republicans have said they’re not planning to do anything illegal. The U.S. Justice Department plans to send election monitors to four North Carolina counties — including one that’s being sued for allegedly removing thousands of voters from the rolls. The NAACP on Monday filed a lawsuit alleging that Cumberland, Moore, and Beaufort counties have illegally removed thousands of voters from the rolls, the vast majority in Cumberland County. Terri Robertson, the elections director for Cumberland County, told NBC News last week that around 3,000 voters have been removed. North Carolina, named as a defendant in the suit, says the removals are legal. Robertson did not immediately respond to a request for comment about the Justice Department’s plans. A Justice Department spokesman didn’t immediately respond to a request for comment. North Carolina is making it too difficult for voters who were wrongly left off the rolls to have their ballots counted, threatening thousands with disenfranchisement, voting rights advocates say. The case has received far less attention than an NAACP lawsuit filed this week alleging that voters in the state are being illegally removed from the rolls. But it could ultimately affect several thousand voters. North Carolina is shaping up as perhaps the single most important state in the race for the White House and control of the Senate. Voting rights advocates sued North Carolina earlier this year, alleging that the state has failed to process thousands of voter registration applications made through the DMV. Last week, U.S. Judge Loretta Biggs issued a preliminary injunction, saying North Carolina likely violated the National Voter Registration Act. Biggs ordered that voters who say they registered through the DMV but find they’re not on the rolls be allowed to cast a provisional ballot that must be counted unless the state can produce a signed form showing the voter declined to be registered. But Allison Riggs, a lawyer with the Southern Coalition for Social Justice, said the process the state announced for complying with Biggs’s order is badly flawed. In addition to filling out an application for a provisional ballot, voters will also be required to complete a separate attestation form, swearing on penalty of perjury that they did register to vote at the DMV. That could deter legitimate voters, Riggs said, who may not trust their memory enough to risk perjury charges. It’s also unnecessary, she added, because the provisional ballot application includes a box that voters must check if they registered through the DMV. Under federal law, anyone who has business with the DMV must be offered the chance to register to vote. Voting rights advocates say very few people decline. Many states have been sued for failing to consistently comply with the requirement. Based on provisional ballots from 2014, Riggs estimates that the number of voters who registered through the DMV but were left off the rolls is in the low thousands. Riggs also said the state hasn’t done nearly enough to educate voters about the judge’s order. That means that if a voter finds she’s not on the rolls, she may simply give up rather than going through the process. In response, Josh Lawson, the general counsel for the state board of elections, noted that Judge Biggs's order directs affected voters to cast a provisional ballot "attesting that he or she submitted a voter registration application to DMV or updated his or her address at DMV." Lawson said the provisional ballot application includes an attestation that a voter submitted an application through the DMV, but not that he or she updated his or her address. As a result, he argued, the state needed to add the attestation document to comply with the judge's order. As to the claim that the state hasn't done enough to educate voters, Lawson said a broad public education campaign wasn't required by the judge, because the problem will only affect a small number of voters who fall through the cracks of the DMV registration system. "We're trying to do exactly what the judge wanted us to do," Lawson said. 11/3 10:07 a.m.: Judge: North Carolina's process for challenging voters is "insane"
A federal judge described North Carolina’s process for challenging voters as “insane,” the Associated Press reported Wednesday. But the judge didn’t rule on a lawsuit brought by the NAACP alleging that voters are being illegally removed from the rolls. North Carolina allows citizens to formally challenge a voter’s registration. The NAACP is suing the state over removals of thousands of voters by three counties based on citizens' challenges. In many cases, the challengers sent mail to the voter's address and had it returned as undeliverable. If a challenged voter doesn't show up to a hearing to prove their eligibility, they can be removed. “This sounds like something that was put together in 1901,” U.S. Judge Loretta Biggs said at a hearing Wednesday, according to the AP. Biggs, an appointee of President Obama, added that she was “horrified” by the number of removals in Cumberland County, where most of the removals occurred. Cumberland County elections director Terri Robertson told NBC News last week that around 3,000 voters have been removed. The NAACP says the removals violate the National Voter Registration Act, which bars systematic purges within 90 days of an election. North Carolina says the removals are legal because they’re being done on an individual basis rather than systematically. North Carolina is shaping up as perhaps the most important state in the fight for control of the White House and Senate. A federal judge is requiring the Republican National Committee (RNC) to hand over more information about planned poll monitoring activities. An affidavit or affidavits by a person or persons with personal knowledge setting forth in detail Defendant’s efforts regarding poll watching or poll observation in connection with the 2016 Presidential Election. Defendant’s efforts shall apply to those efforts by any employee, agent, or servant of Defendant, including volunteers and independent contractors/vendors. The affiant(s) shall be an agent, servant, or employee of Defendant. The affidavit(s) shall set forth all material terms of any such efforts, including any geographic areas which are being targeted for poll watching or poll observation and the reason(s) those areas are being targeted. Any training materials or advice, whether written, electronic, or verbal, provided to poll watchers or poll observers shall also be provided. Poll watching and poll observation includes any such efforts concerning early voting, Election Day at the polls, the counting of vote-by-mail/absentee ballots, and post-election canvassing when there may be disputes about counting the ballots of particular individuals. Included within this information shall be any material or advice regarding for whom the poll watchers or poll observers are working and how the poll workers or poll observers may, should, or must respond to any inquiries as to whom they are working for. On Monday, Vazquez had ordered the RNC to turn over any agreements it made with the Trump campaign pertaining to poll monitoring or voter fraud by 5 p.m. EST Wednesday. The RNC is barred from conducting poll watching activities by a 1982 consent decree issued by a federal court after the RNC was accused of intimidating minority voters in a 1981 election in New Jersey. Democrats are asking the court to extend the consent decree for another eight years. Wisconsin plans to deploy “election integrity teams” at polling places around the state. Attorney General Brad Schimel announced Wednesday that the teams, including special agents from the state’s Division of Criminal Investigation, will monitor polling sites for issues including electioneering, observer misconduct or wrongful denial of the right to vote. The news comes amid concern that poll monitors supporting Donald Trump could intimidate minority voters. And it comes after reports that the state has been failing to make voter IDs easily available despite pledging to a court that it would do so. Schimel denied in a fact sheet accompanying the announcement that the plan is politically motivated. Q: Attorney General Brad Schimel ran for office as a Republican. Is this a political effort?A: No. As stated above, the goal is to provide assistance to local officials and to help ensure that the law is followed. The program is being conducted in cooperation with elected district attorneys throughout the state, including both Republicans and Democrats. The individual DOJ employees who assist do so without regard to any personal or political views they might have. Schimel also said the program was conducted in the elections of 2004, 2008, 2010, 2012, and 2014. Wisconsin is shaping up as a key state in the presidential race and the fight for control of the Senate. The U.S. Department of Justice has filed a “statement of interest” favorable to the NAACP in a lawsuit filed by the civil rights group against North Carolina alleging an illegal purge of voter rolls. The Justice Department statement, filed Tuesday night, doesn’t explicitly argue in support of the NAACP’s case. But it sets out a framework for interpreting federal voting law that would likely lead to a finding for the plaintiffs. The NAACP alleges that three North Carolina counties are illegally removing voters from the rolls, in violation of the National Voter Registration Act, which bars systematic removals within 90 days of an election. The suit also offers evidence that the removals have disproportionately affected black voters. North Carolina has said the removals are a legal form of list maintenance, because they’re being done on an individual basis rather than systematically. A hearing in the case was held Wednesday morning. Forty-six states have asked the Department of Homeland Security to help them protect their election systems from cyber hacking, the department has confirmed to NBC. The news, which was first reported by CNN, comes as the U.S. government has publicly accused the Russian government of hacking into the email of Democratic political groups in an effort to influence the election. And some states have seen attempts to hack into their voter registration systems. Scott McConnell, a DHS spokesman, told NBC that 35 local election agencies also have asked for help. McConnell declined to name the four states that haven’t asked for help. Experts say it would be very hard for hackers to affect election results, in part because voting machines are not connected to the internet. Still, DHS has offered its assistance in shoring up states’ systems. Democrats are alleging in court that the Republican National Committee (RNC) violated a longstanding agreement not to conduct poll monitoring activities, and denied the activities to a judge. Lawyers for the Democratic National Committee (DNC) on Monday evening submitted a sworn affidavit in which Ellyn Lindsay, a DNC poll worker, describes meeting a woman named Shana Holland who described herself as an RNC poll watcher at a Las Vegas polling place last week. Lindsay added: "Ms. Holland also told me that she had been instructed by the RNC that she did not have to tell anyone the party or organization for which she was observing the polls. Specifically, she showed me an email that she said was from the RNC, and which stated in bold lettering that as a poll worker she was not obligated to tell anyone that she was observing with the Republicans." Lindsay also alleges in the affidavit that the Republican poll-watcher told her that the previous day, a Trump campaign poll watcher had been asked to leave the voting site for yelling at voters, accusing voters and poll workers of breaking the law, and giving incorrect information. Earlier Monday evening, U.S. District Judge John Michael Vazquez issued an order requiring the RNC to turn over any agreements it made with the Trump campaign pertaining to poll monitoring or voter fraud by Nov. 2 at 5 p.m. EST. Democrats are suing the Trump campaign, Trump ally Roger Stone, and four state Republican parties, alleging illegal voter intimidation. The four lawsuits, filed Monday, charge that state parties in Arizona, Nevada, Ohio and Pennsylvania are teaming up with the Trump campaign and Stone to raise unfounded fears about voter fraud and intimidate minority voters. The lawsuits cite the Voting Rights Act and the Ku Klux Klan Act, which aim to prevent voter intimidation. “The campaign of Donald J. Trump, Trump’s close advisor Roger J. Stone, Jr., Stone’s organization Stop the Steal Inc., the Nevada Republican Party (“NRP”), and others are conspiring to threaten, intimidate, and thereby prevent minority voters in urban neighborhoods from voting in the 2016 election,” the Nevada complaint alleges. The suits ask the judges to bar activities that could lead to voter intimidation. Trump has numerous times talked about the threat of voter fraud, and has urged his supporters to closely monitor voting in “certain areas”—widely understood as a reference to minority neighborhoods. He has sometimes singled out Pennsylvania as a likely location for fraud. The Trump campaign did not immediately respond to a request for comment. An email sent to an address provided on the website for Stone's Stop the Steal was not immediately returned. Trump has offered no evidence that such fraud is occurring, and experts say voter impersonation fraud is extremely rare. Stone, a controversial Trump supporter and one-time adviser, is reportedly organizing a volunteer “exit polling” operation that would take place in minority areas across the country. Marc Elias, the lead lawyer on the lawsuits, is a top lawyer for the Hillary Clinton campaign. Rick Hasen, a leading election law scholar, wrote Monday: “It is not clear that a court would issue a vague order to stop 'voter intimidation,' as requested in the relief in these suits (as that term would be vague and difficult to enforce). But the suits will first bring publicity to the activities, and second get these parties on record stating that they do not plan on engaging in voter intimidation, which itself could be useful in the event of problems on election day. Timothy La Sota, the general counsel of the Arizona GOP, called the lawsuit "outrageous." "The relief they request is Orwellian," La Sota told NBC News. "Trying to get a court to prevent people from participating in the political process in ways that are protected by the First Amendment." Voting rights lawyers have filed suit against North Carolina and three counties on behalf of the state's NAACP chapter over what they allege is an illegal purge of the voter rolls. The complaint charges that the counties have been "cancelling the voter registrations of thousands of North Carolina voters who have been targeted in coordinated, en masse challenge proceedings brought in the final weeks and months before Election Day, and whose right to vote has been challenged solely on the basis of a single piece of undeliverable mail, in clear violation of the National Voter Registration Act (“NVRA”) and other federal laws." A spokesman for the North Carolina Board of Elections didn't immediately respond to a request for comment on the lawsuit, but the boards said last week that it believes the removals of voters are legal. The three counties named are Cumberland, Moore and Beauchamp. A Texas judge has ordered local election officials in San Antonio to stop incorrectly telling voters that photo ID is required to cast a ballot. The Friday afternoon order by Judge Michael Mery came after voting rights advocates sued Bexar County, alleging that signs at polling places and other materials put out by the county say photo ID is required. Jacquelyn Callanen, the elections director for Bexar County, has said she will comply with the order. Texas’s voter ID law was recently softened by a federal court. Voters without acceptable photo ID can nonetheless vote if they sign an affidavit affirming their identity. Numerous reports suggest Bexar County is far from the only Texas county continuing to incorrectly tell voters that photo ID is required. A federal judge wants to make sure Florida adds thousands of new voters to the rolls in time for the election. At a hearing Friday morning, U.S. Judge Mark Walker questioned Maria Matthews, the director of the elections division in the Florida secretary of state’s office, about would-be voters who registered during the seven-day extension of voter registration, but have yet to be added to the rolls. A spokeswoman for Secretary of State Ken Detzner said in a statement issued hours later that more than 21,000 applications remain pending, while more than 106,000 have been processed since October 11. For nearly 15,000 of those that are still pending, the state says the voter provided incomplete or unverifiable information. Citing the chaos caused by Hurricane Matthew, Walker earlier this month ordered Florida to extend the voter registration period for seven days beyond the original October 11 deadline. Gov. Rick Scott had initially refused. Detzner, a Republican, has in the past supported restrictive voting rules, including a flawed purge of the rolls ahead of the 2012 election. Gladys Coego, a temporary election worker in Miami-Dade County, was arrested Friday after being caught illegally marking ballots, the Miami Herald reported. Coego, 74, is expected to be charged with two felony counts of illegally marking another person’s ballot. Her job required her to open mail-in ballots. The illegal votes were cast in favor of Miami mayoral candidate Raquel Regalado, a Republican. It’s not known how many illegal votes were cast. Investigators have said Coego hid a black ink pen in her purse, then used it to mark ballots in which the mayoral race had been left blank. They said Coego admitted to what she had done after being caught by a co-worker, but didn't say why. The North Carolina NAACP says the state isn’t doing enough to accommodate voters still recovering from Hurricane Matthew. Rev. William Barber II, the group’s president, said the NAACP has asked North Carolina to add evening and weekend voting hours, and to set up mobile voting units for voters in certain eastern counties that were affected by the storm earlier this month. Gannon said the state is prepared to take further action if it deems it necessary. The controversy comes after several county election boards, which are controlled by Republicans, reduced early voting sites and locations compared to 2012, acting after the state GOP urged them to do so in order to benefit the party’s candidates. In Guildford County, which cut early voting sites for the first week of early voting from 16 in 2012 to just one this year, some voters reported waiting three hours to vote last week, and after two days, voting rates were dramatically down from 2012. Here are the states where in-person early voting is currently underway, as of October 27. Civil rights advocates in North Carolina say voters have been illegally removed from the rolls after their eligibility was challenged. The state has said the thousands of removals are legal. Around 4,500 voters in Beaufort, Moore and Cumberland counties were challenged, in many cases after mail sent to their address was returned, the state confirmed in a letter sent Thursday to the NAACP. The majority were in Cumberland County, the letter said. North Carolina law allows for private citizens to formally challenge a voter’s eligibility ahead of an election. Cumberland County elections director Terri Robertson told NBC News that around 5,000 voters had been challenged since the start of the year, and around 3,000 had been removed. She said she was too busy with the election to provide exact numbers. Beaufort County elections director Kelli Hopkins told NBC News that 14 voters have been removed, and hearings are pending for about 90 more. Moore County elections director Glenda Clendenin told NBC News that between 300 and 400 voters had been removed in the most recent of two rounds of removals. She declined to estimate how many had been removed in the first round. All three officials said that if challenged voters don’t respond to letters or show up to a hearing on their eligibility, they are typically removed. Voting rights lawyer Penda Hair said on a Thursday conference call organized by the NAACP that the group believes over 300 Cumberland County voters have been removed. One challenged voter, Grace Hardison of Beaufort County, is a 100-year-old African-American woman who for much of her life couldn’t vote thanks to Jim Crow laws, and has been on the rolls for 30 years, her nephew Greg Satterthwaite said on the NAACP call. The challenge to Hardison was eventually withdrawn and she remains on the rolls. Hair said the removals violate the federal Motor Voter law, which bars systematic purges of the rolls 90 days ahead of an election. Last week, the NAACP notified the state board of elections in a letter that intends to sue. In a response sent Thursday to NAACP North Carolina president William Barber II, state board of elections director Kim Strach maintained that the removals were legal because they’re being done on an individual basis rather than systematically. NBC News spoke with Toni Pippins-Poole, the elections director for Dallas County, where some of the reports of vote flipping have occurred. She explained that the county’s protocol for when voters complain about problems with machines is to cancel the ballot and recalibrate the machine. If they get a second complaint about the same machine, they take it out of service. She said five machines have so far been taken out of service. However, Pippins-Poole said that in no case have administrators been able to replicate the error reported by a voter, and every voter who complained has ultimately been able to vote successfully. Pippins-Poole said a lot of the complaints they’ve received stem from the fact that the “Summary Page” that voters see at the end says “Incomplete” if they didn’t vote in every race. This often confuses voters into thinking that the votes they did cast have not been recorded (though it wouldn’t explain flipping votes from one candidate to another). She said there can also be other forms of voter error, such as when jewelry touches the screen, accidentally registering a vote. Other election directors where voters have complained about flipped votes have also attributed the problem to voter error. However, many touch screen machines are over a decade old, so election experts have expressed concern about the potential for malfunctions. A machine in Pennsylvania in 2012 changed votes from Obama to Romney, and there have been credible reports of votes being changed from Clinton to Trump in North Carolina this year. Poll-workers and flyers in some Texas counties have incorrectly told voters they need a photo ID to cast a ballot, voting rights advocates say. The claims add to concerns that Texas is failing to fully implement a federal court ruling that substantially loosened the state’s ID law. At least two counties, Bexar and Denton, posted outdated flyers which inaccurately tell voters that photo ID is required. 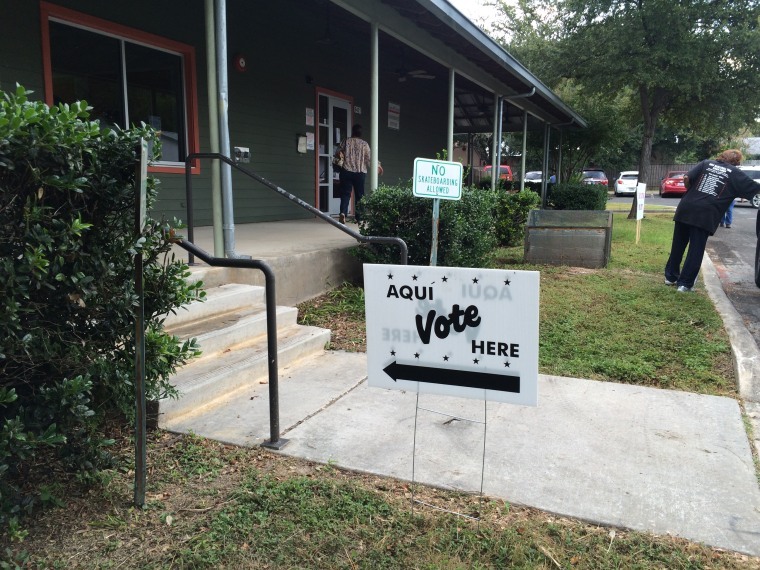 A voter in Denton County reported being turned away for lack of a photo ID. At at least two sites in Houston, voters said poll workers incorrectly told them they needed ID. In Denton County, an armed patrol person was seen talking to voters waiting in line. Alicia Pierce, a spokeswoman for Texas Secretary of State Carlos Cascos, said that in response to the complaints, her office had sent a reminder to counties to use updated flyers, which correctly inform voters that they can vote without photo ID if they sign an affidavit swearing to their identity. Voting never goes perfectly smoothly in any election. But this year could bring a perfect storm of problems. One presidential candidate has made sweeping claims about the threat of voter fraud, and urged supporters to monitor the polls, raising fears of intimidation. Restrictive voting laws will be in place in several states, and even recent court-ordered changes to some laws are likely to cause confusion. Most states are using voting machines that are over a decade old and at risk of malfunctioning. And as if that weren’t enough, this will be the first presidential election in over half a century without the full protections of the Voting Rights Act. That’s why from now through Election Day and beyond, we’ll use this page to track reports of voting problems and irregularities. That includes claims of fraud or intimidation, long wait times, machine snafus, controversies over counting votes and anything else that could threaten the right to vote or the integrity of the process. NBC News will update this list frequently, with the newest developments at the top.